Integrated security manufacturer TDSi will be appearing on several of its partners’ stands at IFSEC International in London next month. 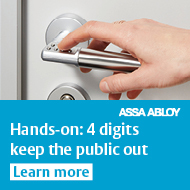 On ASSA ABLOY’s stand TDSi was demonstrating the integration of the Aperio wireless door locking systems with its EXgarde security management software, providing a direct, secure connection between these systems and CCTV, intruder alarms, Microsoft Active Directory and other integrated systems. The company was also presented on the Milestone Systems’ stand in partnership which delivers integrated access control through the Milestone Xprotect VMS engine. TDSi products has featured on Anixter’s stand the new GARDiS software platform range.